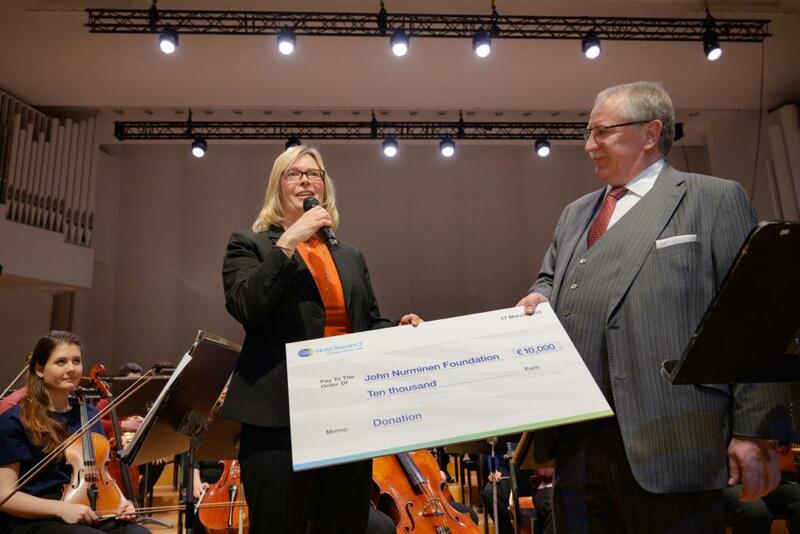 Nord Stream 2 AG donated 10,000 euros to the John Nurminen Foundation for its Baltic Sea protection and marine culture work at the Baltic Sea Philharmonic’s benefit concert held at the Finlandia Hall on Sunday, 17 March 2019. The orchestra donated to the Foundation one euro of each ticket sold for the concert. Nord Stream 2 topped this with its own contribution. ”The Baltic Sea is the home of our pipeline. It’s important for us to enhance projects aiming at improving the state of our common sea and also the co-operation between the countries around it. The John Nurminen Foundation is doing excellent work in this field, and we are very pleased to be able to support their activities“, says Minna Sundelin, Stakeholder Relations Manager Finland at Nord Stream 2 AG. “It is wonderful that people can be inspired and brought together to support the protection of the Baltic Sea in a natural way through culture and music. The young musicians of the Baltic Sea Philharmonic are impressive and credible ambassadors for this cause”, notes Annamari Arrakoski-Engardt, Secretary General of the John Nurminen Foundation. The John Nurminen Foundation aims to save the Baltic Sea and its heritage for future generations. The Foundation’s Clean Baltic Sea projects improve the status of the Baltic Sea with concrete measures that reduce the load and environmental risks faced by the sea. The John Nurminen Foundation has initiated over 30 Clean Baltic Sea projects, of which 21 have been completed. The Baltic Sea Philharmonic is a unique Nordic orchestra supported by Nord Stream 2 AG that brings together musicians from Denmark, Estonia, Finland, Germany, Latvia, Lithuania, Norway, Poland, Russia and Sweden. The orchestra under the baton of its electrifying conductor Kristjan Järvi returned back to Finland yesterday for the first time since 2016, with Helsinki the fourth of five stops on their ‘Nordic Pulse’ European tour of Lithuania, Latvia, Estonia, Finland and Russia. Founded in 1992, the purpose of the John Nurminen Foundation is to save the Baltic Sea and its heritage to future generations. The Foundation has been awarded for its work as a communicator of information and producer of marine content. The goal of the Foundation’s Clean Baltic Sea projects is to improve the condition of the Baltic Sea with tangible measures that will reduce the load and environmental risks directed at the sea. Our work is steered by measurable results and impact.